So you think you have what it takes to go swimming with sharks? Then you've come to the right place, because with Marine Dynamics Shark Tours you're in for a once-in-a-lifetime Great White Shark Adventure! Few things compare to the adrenalin rush and exhilaration one gets from being face to face with a 4 m Great White Shark, especially when they curiously cruise right up to the cage and eye you within kissing range! The experience puts you in their territory and the safety of the activity allows you to only be an observer to learn what Great White Sharks are really like. Our One-of-a-kind purpose built boat is the first aluminium boat of its kind, designed and built for low maintenance, stability, speed and superior safety and comfort. So you think you have what it takes to go Shark Cage Diving in Cape Town? You tell all your friends that you’re one of the few people crazy enough to go swimming with sharks don’t you? Well if you are, then you’ve come to the right place, because with Marine Dynamics Shark Tours you’re in for a once-in-a-lifetime Great White Shark Adventure. We welcome people visiting Cape Town with an appetite for adventure and a healthy dose of adrenalin running through their veins. 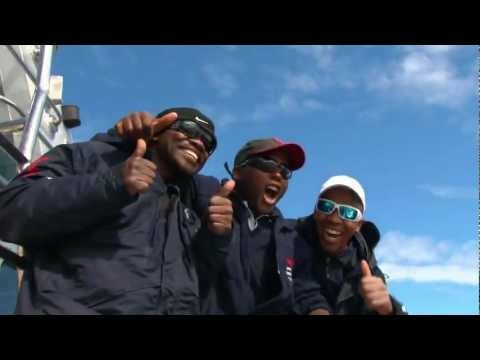 Marine Dynamics is a Fairtrade certified operation offering Shark Trips from Cape Town that are both Invigorating and Educating. You will have face-to-face encounters with lots of Great White Sharks and leave with a new admiration for the oceans most ferocious predator. Kids under 5 free of charge! Slashfin is the Biggest and only boat in the industry with a spacious upper deck for extraordinary photographic opportunities and surface viewing. If you book online you get a free video of your Shark Cage Diving Experience. No diving experience is required to cage dive, all you need is a healthy sense of adventure! The Great White House and Head Quarters of Marine Dynamics have raised the bar in the sharking industry when it comes to hospitality and making clients comfortable. Breakfast is provided upon arrival and a light lunch served at the end of the trip. Onboard there will be soft-drinks and snacks for during the trip. South Africa is the only place in the world where you can go shark cage diving 12 months of the year. Gansbaai is a short distance from Cape Town and offers Great White sightings all year round. We have ideally located and very comfortable Bed & Breakfast accommodation close to the sea and Cage Diving launch. We also offer transfers from Cape Town at R550 per person. On Marine Dynamics YOUR SAFETY IS OUR PRIORITY. Our Great White Shark Tours are safe for children and elders alike. We have specialised gear and a highly qualified team with years of experience in providing close encounters with one of natures most feared predators under extremely safe conditions.